Designed for Non- SOLAS vessels such as pleasure craft, workboats and small vessels, the MA-500TR is a compact, waterproof Class B AIS transponder that actively notifies other vessels of your exact position, thus increasing your safety at sea. 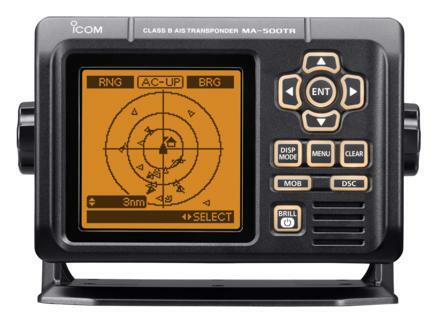 The MA-500TR also has a dual channel receiver allowing boat owners to receive AIS information (both Class A and Class B AIS signals) on two channels simultaneously. This real-time information is then displayed on its large, backlit full dot-matrix display giving the boat owner real-time vessel traffic information thus aiding navigation and collision avoidance. The MA-500TR can work independently or connect with a PC or other marine network equipment. When connected to a compatible Icom VHF radio , an individual DSC call can be made easily from the MA-500TR. Vessel information is automatically transmitted with 30 second or 3 minutes intervals at 2W output power depending on the movement/speed of the vessel. The MA-500TR receives dual AIS channels (Ch. 87B and Ch. 88B) simultaneously and receives both Class A and Class B AIS information. The MA-500TR has three basic display types; Plotter, Target list and Danger list. The “Display mode” button allows you to toggle between these display types. In addition to these displays, the detail screen shows information about the selected AIS target. The MA-500TR can be integrated with the Icom IC-M423, IC-M505* and IC-M603** allowing you to transmit DSC individual calls to a selected vessel instantly without manual MMSI entry; very handy in an emergency. The MA-500TR can store up to 100 waypoints with a10-character name in the waypoint list. The Man Over Board “MOB” button allows you to set a waypoint on your current position instantly on the plotter display. When the MA-500TR receives a safety-related message from a Class A AIS transponder, the message icon appears on the plotter display and the MA-500TR automatically stores the last 20 messages. To withstand the demands of the marine environment, the MA-500TR has waterproof protection equivalent to the IPX7 standard (Except connectors). The MA-500TR can withstand submersion in one metre of water for up to thirty minutes. The MA-500TR has 15-pin D-SUB connector providing 3-lines of NMEA input/output on the rear panel. The supplied NMEA connector cable simplifies the installation and connection to the VHF radio and other navigation equipment. The data speed is programmable from 4,800 bps (IEC61162-1) and 38,400 bps (IEC61162-2) for NMEA1 and NMEA3 ports*. The MX-5000 GPS receiver is a 12 channel parallel GPS receiver with SBAS (Satellite Based Augmentation System) function. The POS (position) smoothing and SOG (speed over ground) smoothing adjustment can be set for the vessel position and speed information. The GPS receiver is tested to and has passed the IEC 60945 exposed environmental test standard. The IC-M400BB 'black box' marine transceiver, can be installed out of sight, which is important, where space is at a premium. The IC- M400BB is controlled by the Icom HM-195 Commandmic. The HM-195 allows operation of all radio functions including DSC, radio, foghorn, hailer horn from the cockpit or fly bridge. The HM-195 utilises the same user soft key interface used on Icom’s latest range of marine radios making control of the radio very straight forward. The IC-M423 is Icom's next generation VHF/DSC has a new user interface which makes driving this Icom fixed mount incredibly simple. This compact radio features Active Noise Cancelling Technology that reduces background noise by 90%. It also packs 10W from its loud speaker making sure your calls are clearly heard. The IC-M423 also has a Public Address & Fog Horn function so when attached to a hailer horn will expand the usefulness of this new radio.